Authorised UK dealers and dealerships on this website sell a range of garden products from over 40+ major garden equipment brands. Our lawn mower search offers you access to a database of over 200 UK authorised lawn mower dealers and lawn mower service centres for quality lawn mower servicing and lawn mower repair providing lawn mower service for leading manufacturers. 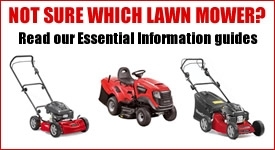 Our lawn mower search offers you access to a database of over 200 UK authorised lawnmower dealers and lawn mower service companies selling competitively priced lawn mowers and garden machinery from leading manufacturers..